Do you miss the real MTV? Always wanted to view all the music videos for one of your Spotify playlists, but could not find anything online? Well now you have a solution! 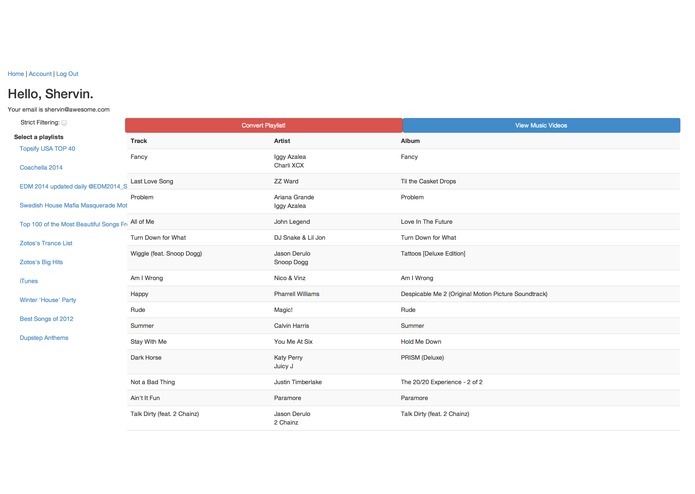 SpotiTube transfers all the songs in the playlist of your choice from Spotify into Youtube. If you select "strict filtering" then it will make sure to only transfer the songs that have an actual music video. Great for parties, just play the YouTube playlist on your TV! Our platform allows you to create your own MTV channel.